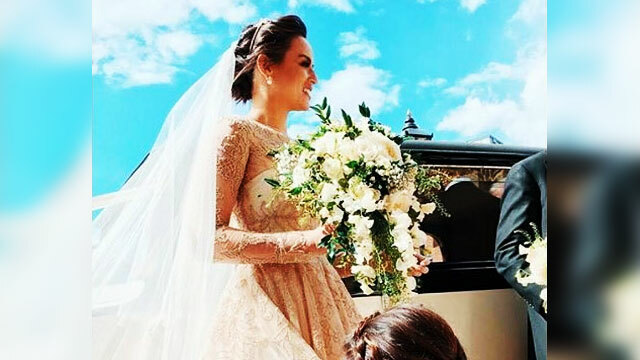 Model-host Georgina Wilson finally made it official and tied the knot with her British beau, businessman Arthur Burnand in the United Kingdom on April 30. The 30-year-old socialite exchanged wedding vows and I-do's with Burnand at St. Peter's Catholic Church in Winchester. Georgina, who was wearing a wedding gown from L.A.-based Filipino fashion designer Monique Lhuillier, was all smiles during the star-studded event. Her bridesmaids included celebrities Anne Curtis, Isabelle Daza, Solenn Heussaff, Bea Soriano and Liz Uy. Other personalities were also spotted during the event like Tim Yap, Raymond Gutierrez, Rajo Laurel, Jasmine Curtis-Smith and BJ Pascual to name a few. Georgina's wedding was strictly private as she explained in her pre-wedding video shot by Jason Magbanua. "I just wanted to keep it private. Whatever feels right at the moment. It wasn't like a conscious—nobody can know, you can't hear about it... I didn't want to explain stuff, I wanted it to happen naturally and then kind of let people share with people after," she said.